Save time and energy during your move with these closet packing hacks. Save time and energy during your move with these closet packing hacks. Moving can be a lot of work, especially if you pack your own things. Your closet can be one of the trickiest areas, because you want your clothes to stay clean and wrinkle-free so you don’t have to do a bunch of unnecessary laundry once you get to your new home. The right movers in Greensboro, NC offer a full range of moving services from packing to transporting your things. But if you prefer to do your own packing before the movers arrive, try these time saving tips for packing your closet. Organize. If your clothes are not already organized in your closet, you may want to organize while you are packing them. Organize by season and by type, such as work clothes, casual clothes, formal wear, etc. Do the same for shoes and accessories. Pack Off–Season Clothes First. You can save some time by packing the out of season clothes farther ahead of time because you know you won’t need to wear them during the moving process. Having less to do the week you move is always an advantage. Leave Clothes in Drawers. When it comes to packing dressers, leave the clothes in the drawers and simply remove the drawers. Seal the drawers with plastic wrap or cover with garbage bags to keep clothing clean. Wardrobe Boxes Can Help. It is not necessary to get special wardrobe boxes, but they can be very convenient. These are cardboard boxes with a built-in metal rod to hold clothes that are on hangers. 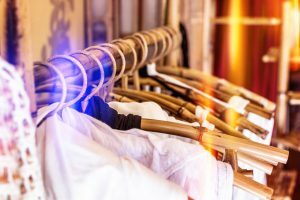 If you wish to skip the added expense, simply cover groups of hanging clothes with garbage bags and drape them over other boxes and items in your moving van. Vacuum Seal Off Season Clothes. To save space you may want to consider a vacuum sealing bag system for the out of season clothing that you won’t need right away. It can make immediate packing easier and save storage space once you get to your new home. Pack Shoes Separate from Clothes. Shoes may stain or snag clothing when packed in the same box. Shoes are heavy, so pack them in small boxes separate from your clothes. Pack a Suitcase for Moving Week. Apart from your boxes of clothes, pack one week of clothes like you were going on vacation. Moving can take longer than you think, and organizing all of your things so that you can find them takes even longer. Making sure you have at least a week’s worth of clean clothes set aside will be extremely helpful. If you wish to avoid the hassle of packing all of your clothes, shoes, accessories, and other items, consider hiring complete moving services from packing to unloading and unpacking. Steele and Vaughn movers in Greensboro, NC offer a full range of moving services that can make your relocation as easy as possible. Reserve your moving date now as the schedule fills up fast. Call (336) 273-0546. Trust Steele & Vaughn for renowned moving service, clean and safe storage, and professional moving and packing services. We are a North Carolina moving company serving Greensboro, Winston-Salem, High Point, Burlington, Charlotte and beyond. Whether you need moving services in Alamance, Caswell, Davidson, Davie, Forsyth, Guilford, Montgomery, Randolph, Rockingham, Stokes, Surry, Yadkin, and all surrounding counties, we are your North Carolina moving company of choice. Call Steele & Vaughn today at 1-336-273-0546 for the best Greensboro moving company to meet your personal needs and deliver proven, stress-free service.